"A wonderful place to call home!" Apartment for rent in Chatham at 383 Wellington Street West. Kent Manor's blended community of seniors and working professionals really make this a wonderful place to call home. Our historical character and charm is unlike any other building in the city. We offer an arrangement of bachelor, one and two bedroom suites in a variety of layouts. Our beautifully kept grounds and gardens are a sight to see as well as the breath taking magnolia trees around the property. Our newly installed elevator as well as outdoor wheel chair ramp and automatic doors will give you peace of mind and all the freedom to come and go as you please. Our friendly onsite building staff are always on hand in and around the building as well as emergency contact service available 24 hours a day, seven days a week. Conveniently located in the centre of the city, on the bus route, one block from Chatham Kent Health Alliance and shopping downtown Chatham. 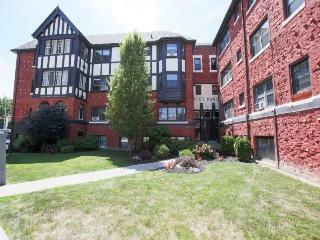 Within walking distance to hospital, downtown Chatham shopping, parks, cultural theatre and on the bus route. Amenities include Laundry facilities, Internet ready, Stove, Convenience store, Hardwood floors, Parks nearby, Visitor parking, Cable ready, Schools nearby, Public transit, Video surveillance, Keyless entry, Shopping nearby, Elevators, Sunporch, On-site staff, Fridge, Wheelchair access and Outdoor parking.